Don't skip out on the fiesta. Whip up these delicious and healthy takes on your favorite tacos, Mexican casseroles, margaritas and more! It's easy to love Mexican food (or at least what passes for Mexican food here in the United States), but many of our favorite dishes are not as healthy or low-cal as I’d like. To lighten things up a little without compromising on flavor, I turned to some top culinary nutrition experts who shared their healthier versions of some Mexican high-calorie favorites. Flavorful tacos, lower-sugar margaritas, spicy and fruity salsas and tasty Mexican sides? We’ve got you covered on Taco Tuesday or whenever the mood for Mexican food strikes. Portobello mushrooms have a meaty texture and flavor, and each cap has less than 20 calories, making them a super light taco filling. A sheet pan makes this recipe weeknight-friendly, and while it calls for slicing a carrot into matchstick-size slices, you could save even more time by buying shredded carrots. For those who like a little more protein in their meals, add some no-sodium-added canned beans to your taco. When it comes to making tacos, I trust Sara Haas, RDN, LDN, author of Taco! Taco! Taco! These festive, gluten-free mini taco cups will make a great impression if you’re having friends or family over for a Taco Tuesday themed meal. But they’re also a fun way to liven up everyday dinners. A simple cookie cutter makes quick work out of creating the corn tortilla base and a muffin tin transforms them into little taco cups. Instead of meat, this dish calls for an easy pantry staple: canned pinto beans. Plant-based protein brings more fiber (and therefore, more nutrition) to taco night. This is the kind of taco you’ll be dreaming about for days after you eat it! All the flavors are like a party in your mouth. The chorizo is mixed with black beans so you get the perfect amount of smokiness without driving the calories through the roof. 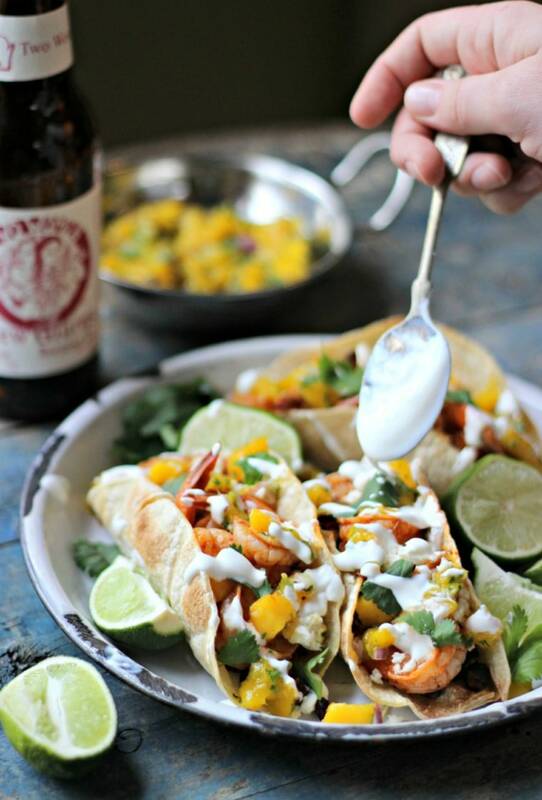 And the sweet mango salsa is an ideal partner to the smoky taco filling. To keep with the lightened-up theme, the lime crema is made with nonfat Greek yogurt. Flank steak is a lean cut of beef that provides protein, iron and zinc. Here, it’s paired with summery nectarines and corn, which work deliciously with the soy marinade. Shrimp tacos are perfect for Cinco de Mayo or any other night because shrimp cooks up in minutes on the grill or in a grill pan. (One note: For full flavor, don’t skip the 20-minute marinade.) Busy cooks will also appreciate the bagged broccoli slaw mix — a shortcut that doesn’t skimp on nutrition. A serving of this easy ingredient provides fiber, vitamins A and C, and other health protective plant compounds. When mixed with the avocado-yogurt dressing, it’s an incredible taco filling. Casseroles are so hearty, but they’re often heavy handed with the cheese — typically around two cups’ worth. This recipe shaves ½ cup of high-calorie cheese, while also packing in plenty of nutrition positive foods, like brown rice, canned pinto beans, and corn and peppers. It’s a dish that delivers on taste, nutrition, as well as satisfaction, thanks to the fiber and protein it packs. Instant Pot lovers, this one’s for you! Mole is a signature Mexican sauce that often features a surprise ingredient: unsweetened chocolate. Yep, this smoky-sweet sauce gets a hint of chocolatey flavor from unsweetened cocoa. The seasoning blend is full of health boosters: Unsweetened cocoa has been shown to protect the heart and brain, cinnamon has been linked with blood sugar improvements, and cumin is said to improve digestion. But it’s the flavorful combo of these and other aromatic spices that make chicken mole a standout Mexican meal. A casserole that keeps things lean by replacing tortillas with sliced zucchini? Count me in! This swap, often used in lasagna (otherwise known as an Italian casserole) means you get all the flavor and satisfaction of enchiladas without the carbs. It’s up to you if you want to serve this veggie-packed dish as a main or a side. With all those veggies plus whole grain quinoa and black beans, this recipe provides plenty of vitamins, minerals, fiber and other wonderful plant compounds. The colors and flavors, which include a citrus-y lime juice-olive oil dressing, will win you over any day of the week. Mexican street corn makes my mouth water but the authentic version is coated with a not-so-light mayonnaise and sour cream combo. That’s why I was excited by this side salad, which replaces the high-calorie creaminess with nonfat plain Greek yogurt. You can enjoy it as a side dish or a dip, and if you don’t have fresh corn, frozen works, too. Gazpacho usually reminds me of a salsa-style soup, but here’s a new twist: A blend of cucumber and pineapple is mixed with traditional Mexican seasonings, including jalepeno and cilantro. Not only is it nutritious, but soup is especially filling, making it an ideal choice when you don’t want to overdo it. What better way to celebrate Cinco de Mayo — or any ordinary day — than with a sparkling sangria? With a full cup of blueberries, strawberries and an orange, this version doesn’t skimp on the fresh fruit! And I appreciate that it’s made with 100% sparkling grape juice over other sweeteners. Though one cup of sparkling juice sweetens the entire pitcher, if you like a dryer sangria, you could go easy it. If a Mexican meal isn’t complete without a margarita, give this slightly sweet-and-spicy version a try. The simple syrup is made with a blend of strawberries, rhubarb, fresh ginger, and a little bit of jalapeno for a touch of heat. Typical margarita mixes have about six teaspoons of added sugar, but this recipe calls for much less — and some of the sweetness comes from real fruit.